Review by AllTheBestFights.com: 2017-09-23, disappointing fight between Keith Tapia and Lateef Kayode: it gets two stars. Keith Tapia entered this fight with a record of 17-1-0 (11 knockouts) while his opponent, Lateef Kayode, has an official record of 21-1-0 (16 KOs=76%). Both boxers are not ranked as they haven’t fought for more than one year: Tapia fought on May 13, 2016 losing to Andrew Tabiti (=Tapia vs Tabiti) while Kayode fought on November 4, 2015 losing to Denis Lebedev (=Lebedev vs Kayode). 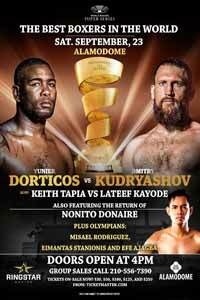 Lateef Kayode vs Keith Tapia is on the undercard of Yunier Dorticos vs Dmitry Kudryashov. Watch the video and rate this fight! Review by AllTheBestFights.com: 2015-11-04, pretty good finish but the rest of the fight was not so exciting: Denis Lebedev vs Lateef Kayode gets two stars. Denis Lebedev entered this fight with a pro boxing record of 27-2-0 (20 knockouts) and he is ranked as the No.3 cruiserweight in the world (currently the #1 in this division is Grigory Drozd). He lost to Guillermo Jones in 2013 (=Lebedev vs Jones) but then he came back to win beating Pawel Kolodziej (=Lebedev vs Kolodziej) and Youri Kayembre Kalenga (=Lebedev vs Kalenga). His opponent, the undefeated Lateef Kayode, has a perfect reord of 21-0-0 (16 KOs=76%) and he entered as the No.20 in the same weight class. He has fought once in 2015 winning over Nick Kisner. 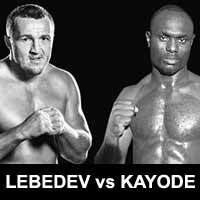 Lebedev vs Kayode is valid for the WBA World cruiserweight title; undercard of Alexander Povetkin vs Mariusz Wach. Watch the video and rate this fight! 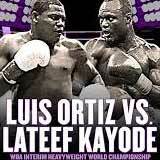 Review: 2014-09-11, disappointing finish between Luis Ortiz and Lateef Kayode: we can’t give more than two stars. Both undefeated, the Cuban Luis Ortiz entered this fight with a perfect record of 21-0-0 (18 KOs=85%) and he is ranked as the No.41 heavyweight in the world, he has already fought once in 2014 beating Monte Barrett (=Ortiz vs Barrett). His opponent, the Nigerian Lateef Kayode, has a professional record of 20-0-0 (16 KOs=80%) and he entered as the No.46 in the same weight class, he has fought once this year as well defeating Jonte Willis (=Kayode vs Willis). Ortiz vs Kayode is valid for the interim WBA World heavyweight title. Watch the video and rate this fight! Review: 2014-01-10, fight not so exciting between Lateef Kayode and Jonte Willis: it gets two stars. The undefeated Lateef Kayode ranked as the No.51 heavyweight in the world, entered the fight with a record of 19-0-0 (15 KOs=79%) while Jonte Willis had a record of 9-7-1 (3 knockouts). 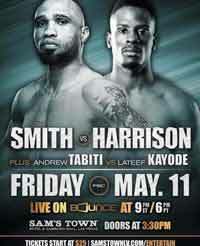 Kayode vs Willis is on the undercard of Juan Antonio Rodriguez vs Yenifel Vicente. Watch the video! Review: 2012-06-02, pleasant fight between Antonio Tarver and Lateef Kayode but it is not enough to get three stars (fight ended by split decision). Antonio Tarver (29-6-0) entered as the No.2 cruiserweight in the world while the undefeated Lateef Kayode (18-0-0) entered as the No.8. 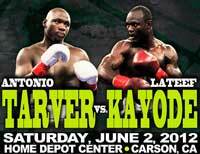 Tarver vs Kayode is valid for the IBO cruiserweight title (Tarver’s first defense). Watch the video! Review: 2011-09-09, the fight between Lateef Kayode and Felix Cora Jr was not very esciting: 2 stars. Kayode defeated Cora Jr by unanimous decision retaining his NABA cruiserweight title. Lateef Kayode (17-0-0) entered as the No. 7 cruiserweight in the world while Felix Cora Jr (22-5-2) entered as the No. 63. Watch the video! Review: 2011-06-10, also with three knockdowns the fight between Lateef Kayode and Matt Godfrey was not very exciting. Kayode knocked down Godfrey in the first, fifth and ninth round but he won by unanimous decision; Kayode vs Godfrey was valid for the NABA and NABF cruiserweight title. Watch the video!